Fish, shellfish and other seafood products contain varying amounts of cholesterol. While your body needs a certain amount of cholesterol to build healthy cells, create vitamin D, manufacture hormones and produce digestive enzymes, too much cholesterol increases your risk of developing atherosclerosis, or narrowing of the arteries. When you look up the cholesterol content of seafood, remember to also consider the amount of saturated fats and omega-3 fatty acids in the food. Shrimp contain more cholesterol than other forms of seafood. 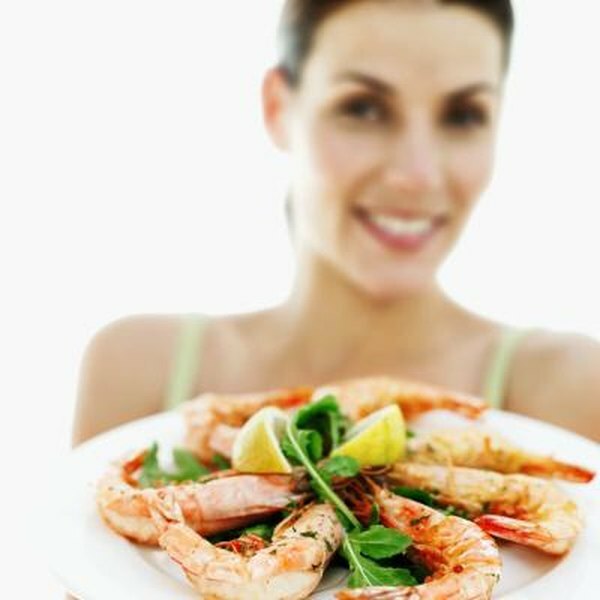 A 3-ounce serving of cooked shrimp delivers about 180 milligrams of cholesterol, an amount that puts you close to the recommended daily limit of 200 milligrams. You'll get about 115 milligrams of cholesterol from a 3-ounce serving of farmed crayfish, and 125 milligrams from a 3-ounce serving of Northern lobster. Raw Pacific oysters pack right around 40 milligrams per serving. Cold water fish also contain significant amounts of cholesterol. You'll get a little more than 80 milligrams of cholesterol from a 3-ounce serving of Pacific herring, while the same amount of Coho salmon provides a little less than 50 milligrams. Saturated fats from seafood and other animal products are thought to raise the level of LDL, or bad cholesterol, in your blood. Crayfish, lobster and oysters all contain less than half a gram of saturated fat per 3-ounce serving, according to the U.S. Department of Agriculture. Fatty cold water fish are higher in saturated fat. A 3-ounce portion of Pacific herring cooked has 3.5 grams of saturated fat, while the same amount of Coho salmon cooked has about 1.5 grams. Tuna, herring, sardines, mackerel, halibut and other fatty cold water fish contain heart-healthy omega-3 fatty acids that help reduce your blood cholesterol, which helps offset their cholesterol and saturated fat contributions. The American Heart Association recommends eating a serving of these fish twice a week to improve your cholesterol. You can lower the amount of cholesterol and saturated fat in fresh seafood by eating it raw -- when appropriate. Opt for heart-healthy cooking methods such as grilling, boiling, baking, broiling and steaming, and use lemon juice, herbs and spices to flavor your seafood. Keep butter and other fatty sauces to a minimum, and avoid breading and frying your seafood. A 3-ounce serving of raw shrimp has virtually no saturated fat and about 107 milligrams of cholesterol, but 3 ounces of breaded and fried shrimp deliver nearly 2 grams of saturated fat and 117 milligrams of cholesterol.